European Expanse | Brüder Grimm-Gesellschaft Kassel e.V. The academic and public activities of the Brothers Grimm were not limited to the Germanic languages, literatures and nations, but reached far beyond that. Jacob and Wilhelm Grimm had professional as well as amicable relationships with many important scholars, authors and artists of their era and were members of numerous domestic and foreign academies and scholarly associations. Since they were highly familiar with the history of their own people, their relationship towards other countries and cultures was very differentiated and open-minded. “The look towards our neighbouring languages, which if it has not already, gradually, will undoubtedly, and partially become meaningful and receive consideration from a historical perspective. In such a way, the majority, if not all, of the links in a large, almost unpredictable chain of language whose roots and inflections extend from Asia to us have found each other.”- Jacob Grimm writes in his 1851 essay on the origin of language in Berlin. The titles of the Grimm’s works can be read like an expansive European cultural history in which more or less every nation is regarded by its language, literature and history. Above this, the Grimm’s linguistic and literary research often functioned as an immediate role model for the development of national philologies and was fruitful to Celtic, Romance and Slavonic studies and even to Baltic and Finno-Ugric Studies. As early as 1811, the Celtic Academy of Paris appointed Jacob Grimm its corresponding member. As a consequence, a very fruitful correspondence and exchange of letters with French philologists and writers followed. While exploring the European animal legends, the Brothers Grimm continually encountered Latin and French sources, like the “Ysengrimus” by the Flemish poet Nivardus or the anonymous Old French “Roman de Renart”. 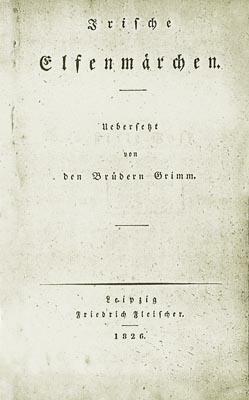 While Wilhelm Grimm intensely coped with Romantic fairy tale tradition as well as with the tradition of Romance legends, Jacob Grimm edited a collection of Old Spanish sagas and gleeman’s literature with the title “Silva de romances viejos”, and published studies on the comparative history of the Roman and Germanic languages. In 1837 the great French historian Jules Michelet edited his “Origines du droit française”, which would not have been possible without the Grimm’s groundwork, for Michelet went directly back to the Grimm’s collection of the “German Law Antiquities”. The Grimms also directly influenced Friedrich Diez, who edited the first essential historical „Grammar of the Romance languages“. The beginning of modern Celtic philology also owes several of its impulses to the Brothers Grimm, who cultivated contacts to Scotland (Walter Scott), Ireland (Crofton Croker) and later also to Brittany (La Villemarqué). In 1813 Wilhelm published “Three Old Scottish Songs”. In 1826 the “Irish Fairy Tales of Elves” translated by Jacob Grimm appeared and in 1847 Jacob’s treatise „On Marcellus Burdigalensis”, in which was able to explain the oldest Celtic linguistic references for the first time was made public. The Brothers Grimm directly influenced Johann Caspar Zeuß, the author of the first historical grammar book of the Celtic languages, as well. The Slavonic world also played an important role in the Grimm’s works, first of all imparted via Vienna, Prague and Kingsburg. Early on they dealt with the so called Old Russian “Song of Igor’s Campaign”, followed by Serbian ethic epics, which made them famous world wide. Other contacts led them to Bohemia, Poland, and finally Russia, where the Grimm’s works fell on particularly fertile ground. “Your grammar book is used as a guideline for the editing of the Russian one; and your German mythology and law antiquities served as a guiding principle for me (…)”, Ivan Snegirev, a Russian ethnologist wrote to Jacob Grimm in 1845. Numerous ethnic and linguistic Slavonic works, such as the classic collection of the “Russian fairy tales” by Aleksandr Afanas’ev or the “Serbian Grammar” by Vuk Karad_i_ were obviously influenced by the Brothers Grimm.- This also holds true for the first essential “Historic Grammar of Slavonic Languages”, which was edited by the Slovene Miklosich from 1852 until 1874. Further works by the Brothers Grimm finally dealt with questions about the Baltic languages and ethnic literature, the Finnish epic “Kalevala”, Modern Greek ethnic literature and many other subjects which evince the whole range of their “European” philology. “The sciences know no boundaries. Their ambition is to bridge the marked gaps between the peoples and solidify the tie that should be bound around all.”, Jacob Grimm writes in 1853.